Just before his third year at Hogwarts begins, Harry learns that a dangerous killer has escaped Azkaban Prison. This changes a lot at school where security is increased in the form of creepy soul-sucking Dementors guarding the school and frightening the students. But it starts to seem like even they aren't enough to keep danger at bay. This year's Defense Against the Dark Arts teacher is Remus Lupin, who Harry and his friends first meet about the Hogwarts Express. Looking completely disheveled, he doesn't impress them at first but soon proves to be their most competent and likable Dark Arts teacher to date. Also in this book we meet Professor Trelawney, a loopy lady who teaches Divination and almost immediately makes a dark prediction for Harry. 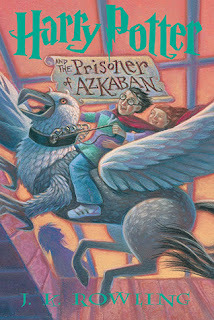 Most importantly, this is the book in which Sirius Black, Harry's godfather, appears. There is SO MUCH to love in this book! There is fun stuff like trips to Hogsmeade, and the Marauder's Map which helps Harry go there since he doesn't have permission. Professor Trelawney's class is rather silly and the first time Hermione has disliked a teacher and a class. She is so wonderfully skeptical, and it makes me love her even more. Hermione has a ton of classes this year, some of which are scheduled at the same time and Harry and Ron spend a decent portion of the story trying to figure out how she's doing it. There are also themes of injustice surrounding Buckbeak the hippogriff who allegedly injured Draco Malfoy (but unfortunately didn't kill him,) and the story of the Sirius Black's imprisonment. This was very enjoyable all the way through, and I'm excited to keep going in the series. I'm also concerned though, because next up is Goblet of Fire and the audio is TWENTY hours long. That is crazypants. I've never listened to one that long and because I'm borrowing these from the library I'm not sure if I'll be able to finish it. I'll just have to plan carefully!